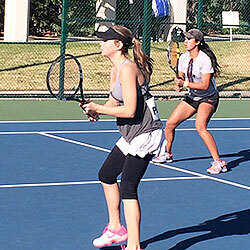 With the growth of technology and online schooling opportunities—and with tennis being a sport that requires a lot of hours on the court in order to excel—more and more recruits seem to be at least contemplating this alternative form of education. Before deciding if this is the appropriate track for you, there are several issues to consider including how it may affect your tennis, prepare you for the future, and be viewed by coaches and admissions officers alike. We will share some anecdotal information on those trends and provide some recommendations which may be useful in deciding if online schooling will be an asset or detriment to your short-and long-term educational and tennis goals. In tennis, we are seeing a surging trend of players contemplating and/or choosing on-line schooling for their high school careers. 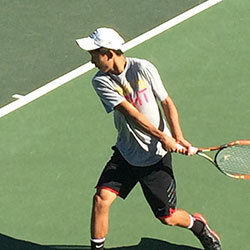 Even players with already proven track records both academically and tennis-wise will sometimes sense that they may lose an opportunity to be recruited by coaches at high level programs because a player doing online schooling may have more time to work on his or her game, and move ahead in the rankings and ratings. There appears to be a concern among some students that even though online schooling is not the route they really want to choose, they feel the need to do so anyway just to keep up in the sport. By this thinking, if a player is taking demanding courses in a traditional school and can only train 8 hours a week, how can he or she keep up with players able to play 20 hours a week due to a more flexible online schooling schedule? Will the flexibility afforded to me by online schooling really translate into an improvement in my tennis, enough to make an impact on the programs I am gunning for? If I decide to go this route and there is an expectation for my game to improve, will I psychologically and emotionally be able to manage the pressure to play more, improve more and win more to get attention from high level programs? If I switch from a high quality traditional high school to an online program, will the quality of my education suffer to the point where I’m less well-equipped to take advantage of the high quality education my tennis put me in line for? In general, the pros of online schooling for recruits seem to revolve primarily around the time and flexibility to train more and the ability to manage more extensive travel to tournaments. Some argue that expanding experience with competitive play can oftentimes generate more reliable data and higher rankings which coaches take note of. Additionally, while exceptions do exist, there seems to be a general feeling that online grades tend to be higher than grades in traditional schooling for comparable courses by comparable students. Certainly if that proves to be true, a student may improve recruiting chances at top academic colleges based on an improved academic index (for those schools that do such a calculation) which is based on unweighted GPA’s. Also of concern is whether the preparation that a student is getting in their online classes will prepare them appropriately for the level of challenge presented by classes at top universities. Parents, students and administrators may acknowledge that the general quality of online schooling has improved, yet may still be hesitant to accept that online schooling can provide the same level of overall education and preparation that a top public or private high school can provide. From the college coaches’ point of view, online schooling generates ideas and impressions all over the board. The one thing that is clear from surveying coaches from many types of colleges is that there are no hard and fast rules with regard to recruiting students who have done online schooling as opposed to students who have opted for the more traditional route. Six years ago, when we first polled coaches at some of the most elite academic schools, online schooling was frowned up at most of the schools whose coaches we talked with. While that sentiment has not changed at some elite schools, the stance on online schools has softened at other elite schools. When there are no hard and fast rules, it is usually a signal that a recruit has to ask a lot of questions of each coach of interest to get the true take from that school. We have found that even coaches from the same conference or school may have different views and biases with regard to online vs. traditional schooling, and how that choice may impact admission to their colleges or participation on their teams. It is not uncommon for one school within a conference to say that Admissions is very open to applicants who have had an alternative form of schooling, while another coach at the same type of college or even in the same conference may suggest that Admissions strongly prefers traditional schooling and would likely rule out recruits with that profile. As one Ivy League coach states, “My admissions office hasn’t been too harsh on online students. If they are taking challenging and AP classes then it doesn’t seem to be an issue – they probably look a little closer at the standardized test scores though.” But at another Ivy League school, the coach told us, “Up until this year our admissions office has ruled out any recruit who has done online schooling. Now at least they won’t automatically rule it out, but it’s still not looked upon favorably.” If a player begins the recruiting process early enough, and can get a read on the tendencies from their top choice colleges or universities early on, that may be able to help with deciding to do online schooling or not, or give them the time to switch paths if a coach is adamant about going in a different direction. Following are more coaches’ evaluations illustrating the varied impressions of online schooling and the perceived effect on admission or team participation. Please note that the coaches’ names are withheld to comply with NCAA rules. “Our admissions office has started to see a growing number of recruited athletes coming out of online programs. I think that Admissions certainly has some reservations about online schooling – both in terms or the rigor of the curriculum and the missing social integration piece – but for those students who are excelling in rigorous online programs, admission is still very viable. The general consensus is that taking an online program ends up putting more scrutiny on the curriculum (i.e. full AP program junior/senior year) and standardized test scores of a prospective applicant. It is important to remember that it is not necessary to be “all in” or “all out” in terms of alternative forms of schooling. Some students who see the benefit in finding more time to train and compete, but are wary of how non-traditional schooling is perceived, may choose to just do 1 or 2 years of online schooling, or even a semester, to try to reap the benefits and avoid the drawbacks of each system. Still others have figured out a hybrid approach in which, for one or two years of high school, they are given permission by their traditional school to take some classes in school, and a few others online. This allows them to leave school early to train, and gives them the flexibility to do their work for certain classes online, while at the same time keeping the continuity of remaining at their school. 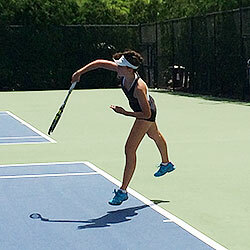 Given that the timeline of recruiting in tennis usually sees the most intensive recruitment finished by the start, or early stages, of the senior year, some consider that a good time to return into a classroom if they want the benefits of more traditional schooling as they are approaching the stage of entering a college classroom. Those starting in a traditional school setting who plan to do a year or two of online schooling before returning to their school need to discuss the re-entry plan with school officials in advance, to insure that their online course selection allows them to flow seamlessly back into the proper level courses at their traditional schools. Again, it is up to each individual player, based on his or her own personal experiences and strengths and weaknesses, to determine whether one educational setting or another would be preferable, or if he or she would benefit from trying to marry the pros and cons of each in a hybrid style of schooling. In summary, we at DTS acknowledge that there are plusses and minuses presented by online schooling in high school, either all or part of the time. Much of the decision is very personal to a student’s individual style, experiences, strengths and weaknesses, but can also be influenced or adjusted based on the type of college and college tennis program he or she is pursuing. Many payers and parents take a shorter term view on this topic, focusing on how it will affect the relatively short term outcome of college admission. The importance of potential longer term ramifications should also be factored in. While alternative schooling may help in some ways with tennis recruitment or college admission, will it properly equip a student for his or her time there, and even beyond? If you are interested in alternative schooling, be sure to thoroughly explore the variety of considerations before making the decision about what is right for you, your tennis, your college search and your academic and personal well-being.